In my maternal home, we always had a variety of greens growing in the yard. It was uncommon for us to buy any greens for the table, but for spinach which didn’t grow. We had tonnes of Amaranth, atleast 5-6 varieties of it, Malabar Spinach (three kinds), drumstick leaves, night shade spinach and some other stuff which are not commercially grown. My mother would step out, pluck enough for either a quick stir fry or a dal, step back inside and cook the greens all inside of 20 minutes. the taste of fresh greens is a treat and cannot be replicated by commercially grown greens one bit. This dish was made from the fresh amaranth leaves I picked from my container garden. Its a glorified name for the assorted pots and old recycled buckets i have up on my terrace where I am attempting to grow a few vegetables and herbs. The bonus was this amaranth. It sprouted on its own because of the seeds present in the soil that was purchased. Each morning I go upstairs, sometimes with my dog Sage, sometimes just a cup of coffee, look around to see what seeds have sprouted, which plant is flowering or fruiting and get anxious if i see a pest or a plant wilting. This is a very simple recipe, that gets done in no time. You can replace the amaranth leaves with spinach or any greens of your choice. 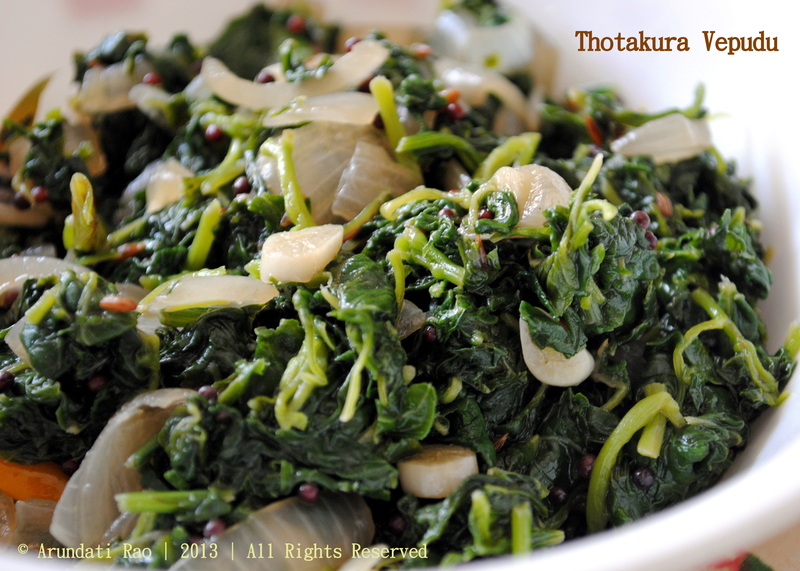 Usually, we add chopped garlic to the greens to increase its flavour. this dish is a good accompaniment with steamed rice and dal / sambhar or roti. In a pan, heat the oil, splutter the cumin and mustard and add the chopped garlic. saute for a minute till aromatic, add the chopped onions and green chilli and fry till the onions are translucent. Add the washed, drained and chopped amaranth leaves and saute the greens a few times. the leaves will sweat and a lot of water will be released, which on a medium to low flame needs to be evaporated, stirring occasionally. Cook for about 4-5 minutes till the pan is almost dry but not sticking. Add the salt, taste and adjust. Switch off the heat and serve up with rotis or steamed rice and dal.